May 07, 2015, 7:21 p.m.
As Baltimore recovers from the disturbances following the death of Freddie Gray, the mayor of the city Stephanie Rawlings-Blake has promised that Baltimore police officers will have body cameras by the end of the year. 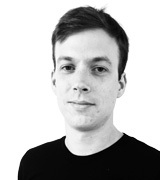 Body cameras are small video cameras which are worn by police officers, recording their interactions with the police. In San Diego, where officers already wear body cameras, their use has led to significant decreases in public complaints about police violence and incidents where the police use force. 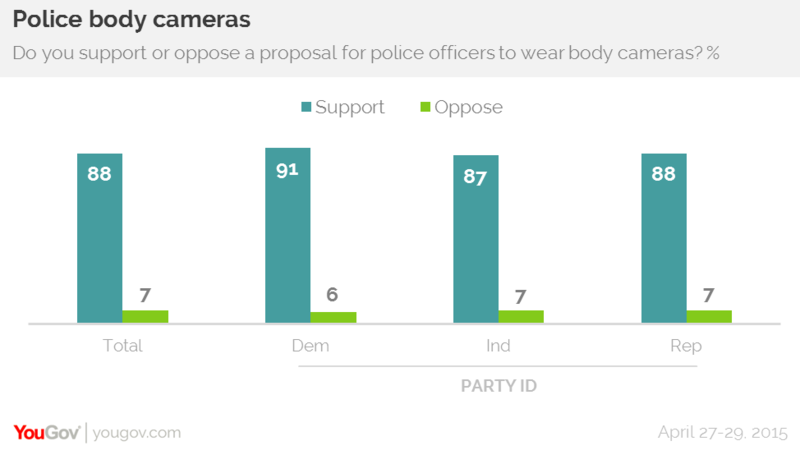 YouGov&apos;s latest research shows that support for body cameras for police officers is very high. 88% of Americans support the idea while only 7% oppose it. Support is very high regardless of demographic group, too, and even though issues of policing and law enforcement often prompt significant partisan disagreement both Democrats (91%) and Republicans (88%) are overwhelmingly in favor of body cameras for police officers. As departments have begun to adopt body cameras for police officers, the major issue confronting lawmakers is how the footage gathered should be handled. Certain departments, including San Diego, refuse to release footage to the public, while others have adopted a policy of releasing footage relevant to certain arrests or all footage collected. 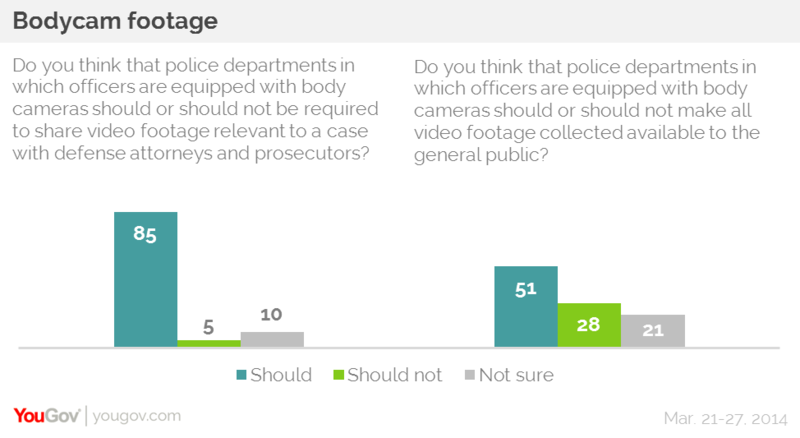 Americans overwhelmingly think that body camera footage should be made available as evidence in legal cases. A small majority (51%) think that all video footage collected should be available to the general public, though 28% say that it should not. 62% of Americans also think that the footage collected by police body cameras should be handed over by the police to an independent authority for storage.